On a different note, the hardware failure did not cause me any data loss at all, since I have a very thorough (read: paranoid) backup strategy, including two local TimeMachine backups in physically separate locations (one at home, one at my lab’s desk) and three cloud services: CrashPlan to backup the complete data on my iMac and in addition an automated Dropbox workflow and iCloud for all the documents. For my current PhD thesis data I even went two steps further and added manual backups to Google Drive and SkyDrive to the mix. But back to the topic of this post. After setting up the MacBook from said TimeMachine backup it occurred to me that there was nothing “exclusively” on that machine, hence a Mavericks setup from scratch as opposed to an upgrade would be a feasible option to get a clean system. And that’s what I did. There’s a lot written on the web about how to do that, so I’m not going into details here. I don’t plan on upgrading to OS X Mavericks (10.9) soon. […] All packaging will still be done on Lion. I’ve had a few reports that my Lion builds work on Mavericks. At least QGIS, GRASS and the frameworks and Python modules. MapServer/PHP is old and probably will not work. Postgres/PostGIS should be OK. Accordingly, the QGIS installer is called QGIS 2.0.1-7 for Lion & Mt Lion, but that didn’t put me off, since I know of people successfully running this release on Mavericks. But before installing the actual QGIS one (unfortunately…) needs to make sure that some dependent packages and libraries are installed. It all starts with the GDAL Complete 1.10 framework package, which can be found here: http://www.kyngchaos.com/software/frameworks#gdal_complete. This will download an image file that contains (amongst others) two packages. First, install the GDAL.pkg, then the numpy.pkg. After having successfully installed GDAL and numpy, you will need to install the FreeType framework v2.4.10-1 and the UnixImageIO framework v1.4.3, both can be found here: http://www.kyngchaos.com/software/frameworks. Again these disk images contain package files that need to be installed. These two frameworks are prerequisite for installing the Matplotlib Python module, which can be found here: http://www.kyngchaos.com/software/python. Needless to say that the disk image contains a package file that needs to be installed. Then, and only then do we have all the necessary frameworks and packages that QGIS itself depends on, hence we can proceed to install the beast itself. The QGIS installer can be found here: http://www.kyngchaos.com/software/qgis and comes in at ~160MB. Notice that the complete installation of QGIS including all aforementioned frameworks will occupy roughly half a gigabyte of space on the hard drive. Now that was easy. Too easy you say? Well, so did I, and went on to setup my MacBook in a way that allows me to access the PostgreSQL database I’m running on my iMac. Local access from within my home network would be sufficient for now. The first step to do so was installing the PostgreSQL client files on my MacBook. Again I relied on the KyngChaos releases, which can be found here: http://www.kyngchaos.com/software/postgres. I personally chose the PostgreSQL Client-only 9.2.4-2, since my database is also running on version 9.2 and I don’t want to run into any version-related trouble. The installation itself is easy, since the downloaded disk image once again offers only one package file to chose from. Now my MacBook should be ready to act as a client for a PostgreSQL database, but apart from accessing it from within QGIS I also wanted a graphical user interface to do more advanced (also non-GIS-related) stuff on the database from the client. My choice as a PostgreSQL UI has always been pgAdmin, so I downloaded the pgAdmin III 1.8.1 client from here: http://www.pgadmin.org/download/macosx.php. To install it you just drag the .app file contained in the disk image and drop it into your Applications folder. Somewhere in there you should find a line (marked above) that reveals the path to your server instance after -D, in my case /opt/local/var/db/postgresql92/defaultdb. In that folder you will also find the pg_hba.conf file we’re looking for, so open that in a text editor of your choice. Please notice that PostgreSQL couldn’t care less about the number of spaces and/or tabs between the entries, these are just for us humans so it looks nice and tidy and can be easily understood. Please note that the keyword trust in the end is quite dangerous. It makes the server accept all connection requests from all servers within the given IP address range (here: my local network domain) without asking who’s trying to connect. 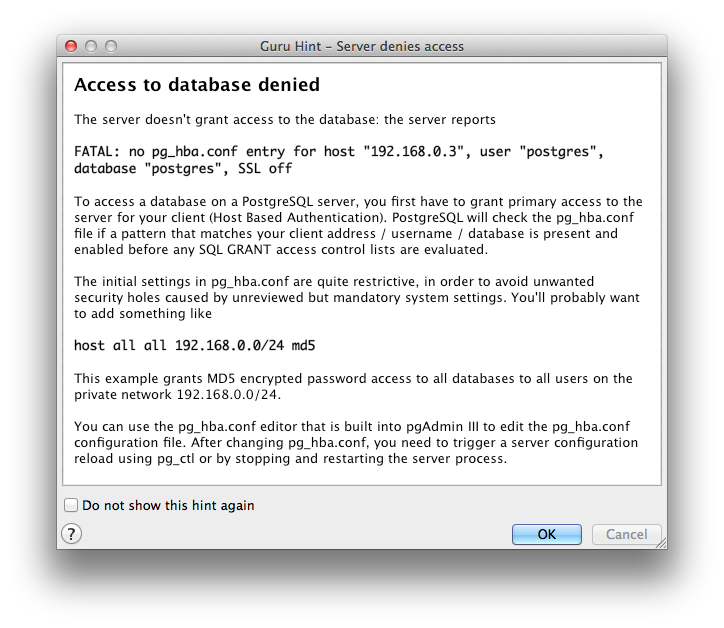 You should never use trust in a production environment or on a database server that is accessible from the internet! Since we didn’t tell the server a location to write its log messages it starts to write them to the current console window. If you want to change that behavior, please refer to the official pg_ctl documentation. Once you’ve seen everything you needed to see, you can safely close this terminal window. Final check: can we now connect remotely to our database server? Looks good from within pgAdmin. How about QGIS? Looks good! Finally, productive work can commence… By the way, so far I didn’t run into any glitches or weirdnesses of Mac OS X 10.9 itself, but I’m also relatively unimpressed with its benefits (read: haven’t found any, yet). It’s a good thing the OS upgrade was free. Please let me know in the comments if you encountered any problems while following these instructions. I’m running QGIS 2.0.1-Dufour on a MacBook Air, with OS X Mavericks, version 10.9.2 and Server 3.0.3. I have successfully installed the server and through phppgAdmin set up a database. 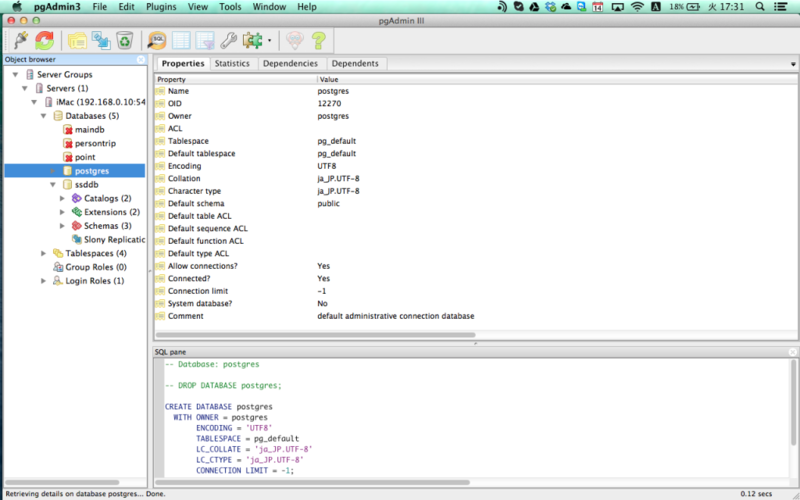 I am now ready to add PostGIS layers, but cannot get QGIS to connect to the localhost server. I followed your instructions above, found the pg_hba_config file and checked the settings. The first uncommented line says: local all all trust, so ostensibly that is in order, but I can’t connect. What else can I try? I’m a newbie at all of this. Rgds, Pine. Hmm, is the local all all trust line the only uncommented line in your pg_hba.conf file? If so, this might be the culprit. The official documentation mentions that local “matches connection attempts using Unix-domain sockets.” host on the other hand deals with TCP/IP connections, and that’s what we need here. May I suggest you try adding the following very generic and very dangerous line I used in my example: host all all 192.168.0.0/24 trust Obviously you will have to make sure the IP address range matches your local settings. If this works (it basically allows all kinds of connections from all addresses in the address range without asking, hence very dangerous!) you could start from there and limit access to your client only. Please let me know how it went! In fact, there are 3 uncommented lines in the pg_hba.config file, one of which is “host all all 127.0.0.1/32 trust” and the other “host all all ::1/128 trust”. My server is not public, as I’m at the development stage on my MacBook Air. Well, the first line deals only with connections from the localhost (127.0.0.1). The second is setup for connections using IPv6 addresses -- I remember I had some issues with that in the past. Again, may I suggest you temporarily include the line I mentioned in my post and in my last comment, and see what happens? Did what you suggested, still no success in getting QGIS to connect. Any other suggestions? One more thing you can try is checking the listen_address option in your postgresql.conf file. It should say listen_addresses '*' to accept connections from any IP address. 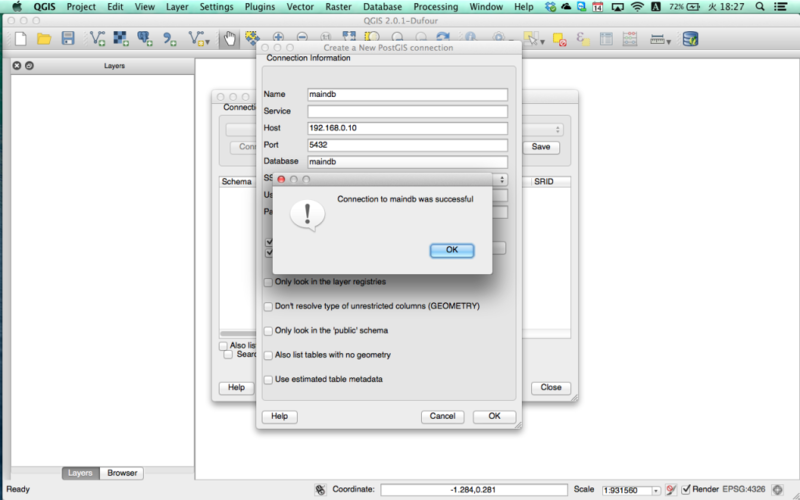 How come my Qgis GUI looks pixelated? I was also told by my computer to download Java SE 6 Runtime…any thoughts on why? I’m sorry, but this question is way too unspecific to be answered in any helpful way. Which version of QGIS? What host OS? How is the Java download (update?) related to the problem? What do you mean by “pixelated”? Also, while I’m happy to help where I can, this question appears to be completely unrelated to the topic of the article, so I suggest you gather some more background information about the problem, sit down to write a more concise and informative explanation of the issue (cf. these guidelines), and post it somewhere more fitting. May I suggest GIS StackOverflow for starters? Or any QGIS forum, newsgroup or mailing list. Good luck, and don’t let small bumps let you scare away from using open source software and especially QGIS! I found your post very helpful. 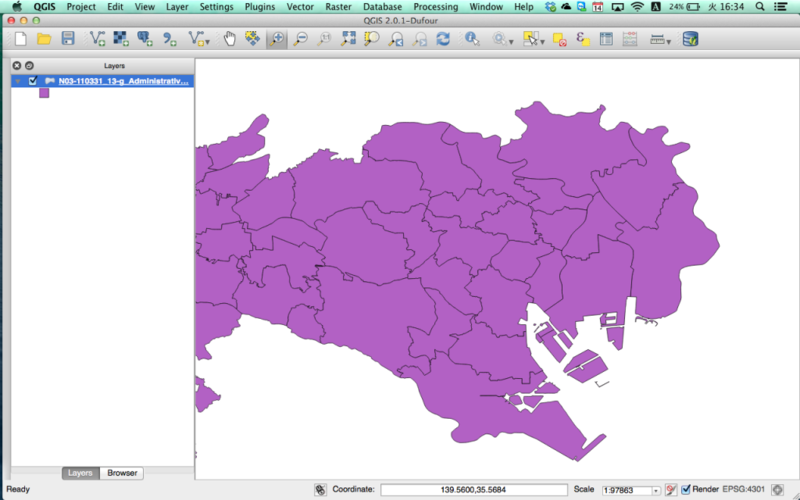 This was my third install of QGIS and by far the smoothest.